Bruxism, or teeth grinding, affects sufferers in a variety of ways. People with bruxism are typically subjected to short-term side effects, but often encounter more serious long-term issues, which can become permanent. If the short –term effects are not treated right away, it will lead to more painful effects. It is best that you seek dental help as soon as symptoms occur. Not only to help you treat bruxism, but also to help avoid tooth loss and destruction. At your dental checkup your dentist can tell whether or not you grind your teeth. Patients who have suffered from bruxism for a long time, actually have flattened teeth with an even, square appearance. The teeth are worn down and become shorter. The longer the bruxism goes untreated, the more noticeable this becomes. In addition, grinding your teeth can damage dental restorations including crowns or fillings, which can cause them to fail and require replacement. The temporomandibular joint (TMJ), which attaches your lower jaw to your skull, is what gives your jaw the ability to move. Bruxism places stress on the TMJ, which can lead to dysfunction that can cause chronic pain. 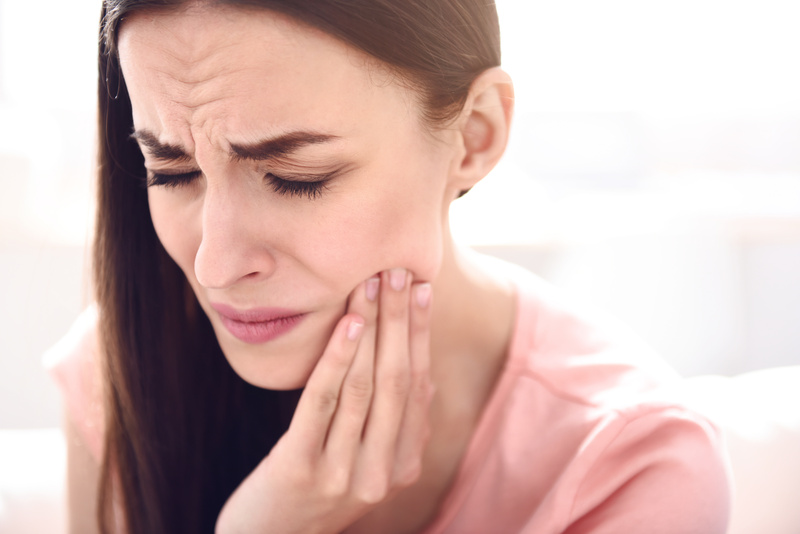 Symptoms of a TMJ problem include headaches, muscle tension in your face or neck, pain when chewing or speaking, or an inability to open your mouth all the way. Grinding your teeth wears down and ages teeth prematurely, therefore the protective layer of enamel can also get worn away. Once the enamel is gone, there’s no way to replace it. The softer tissue becomes exposed and can allow more harmful bacteria into your tooth, leading to cavities. Without the protective layer of enamel, hot and cold temperatures can get to the root of your tooth, making some foods and drinks uncomfortable at best and painful at worst. Grinding your teeth also places stress on your gums and the connective tissue that helps hold your teeth in place. When the connective tissue that anchors teeth is damaged, it can loosen your teeth. Grinding your teeth can cause your gum tissue to become inflamed and look red or irritated. Waking up with headaches and/or an aching jaw, could mean you’re grinding your teeth at night when you’re sleeping. A simple dental exam can reveal whether or not you’re prematurely aging your teeth through bruxism. There is treatment for this damaging dental condition, so seeking help quickly can make a big difference to the health of your mouth. If you or someone you know thinks bruxism may be a problem, we recommend scheduling a visit with one of American Dental Group’s preferred providers. Diagnosing and treating bruxism requires an evaluation and a treatment plan from a reliable, trusted dental professional. American Dental Group partners with independent, hometown dentists to help members save money on dental care. Regular preventative care is the best chance of reducing the risk of bruxism and other oral health concerns. Serving Colorado for over 25 years, American Dental Group takes time to know their dentists and feel confident that our members are getting treatment from the best dentists in the state.